Geek Grotto - Get Your Geek On! : Go Pro On-Demand Channel Hitting Xbox 360 And Xbox One! Go Pro On-Demand Channel Hitting Xbox 360 And Xbox One! Soon you will not only be able to watch Go Pro videos when you want, but also purchase equipment directly from the app! Fulfilled by Microsoft, you can buy Go Pro cameras, mounts, cables, casings, etc right from your console. SAN MATEO, CALIF. (January 30, 2014) ­­– GoPro, enabler of immersive self-capture and engaging personal content sharing, today announced the upcoming launch of its GoPro Channel apps for Xbox 360 and Xbox One® video game and entertainment systems from Microsoft. The GoPro Channel apps will stream on-demand GoPro video content to Xbox Live Gold members worldwide and enable them to purchase GoPro cameras and accessories directly through the app, fulfilled by the Microsoft online store. This is the first time Microsoft has integrated the physical purchase of packaged goods into an Xbox platform app. In addition to streaming curated GoPro programming to Xbox One and Xbox 360 consoles at home, the GoPro Channel apps will also enable Xbox Live members to purchase GoPro cameras and accessories directly through the app, a first for the Xbox platform. In the U.S., orders will be sourced and fulfilled through the Microsoft store. 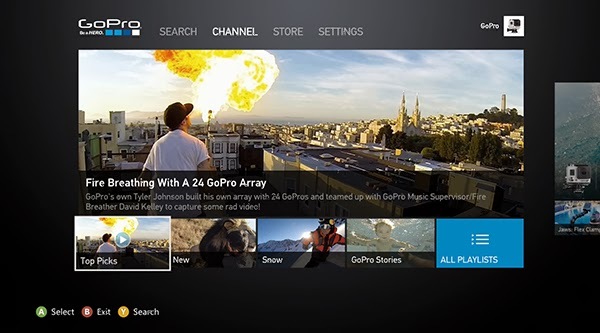 The GoPro Channel app is anticipated to launch on Xbox 360 this spring and on Xbox One this summer. The relationship with Microsoft augments GoPro’s initiative to expand its content distribution and community reach beyond current brand platforms including YouTube, Facebook, Twitter, Instagram, Vimeo and GoPro.com. In October 2013, the company launched a GoPro Channel on Virgin America in-flight entertainment and additional content partnerships are anticipated in 2014. To view content similar to what will air on the GoPro Channel apps for Xbox One and Xbox 360, visit the GoPro Channel on YouTube. For more information on GoPro and its HERO line of cameras and accessories, visit GoPro.com.